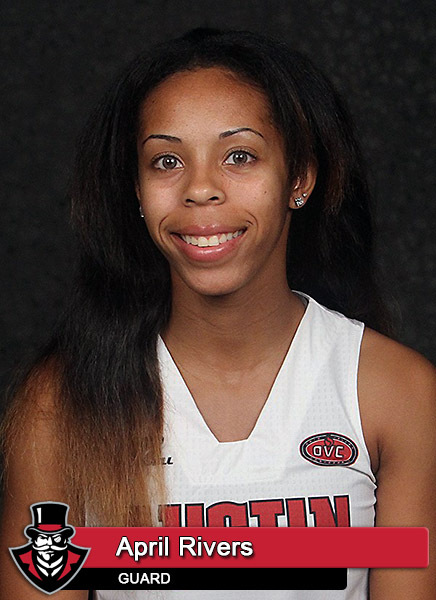 Clarksville, TN – Suffering through its worst shooting night of the 2014-15 campaign, Austin Peay State University women’s basketball team dropped a 71-61 Ohio Valley Conference decision to league-leading UT Martin, Saturday, at the Dunn Center. Austin Peay (8-15, 5-5 OVC) kept the game close through the opening 16 minutes. The Lady Govs held a lead twice in the half – both times by a point – freshman Brianne Alexander giving them the last of those leads with a pair of free throws for a 24-23 lead at the 5:16 mark. However, Austin Peay would only score one more point the rest of the half. UT Martin (14-9, 10-0 OVC) closed the half with a 13-1 run, including the half’s final 10 points, to carry a 36-25 advantage into halftime. 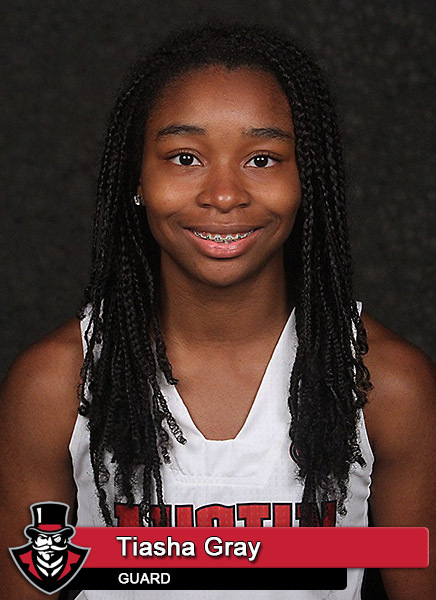 In the second half the Lady Govs were able to close to within seven points, 45-38, thanks to a three-pointer by sophomore April Rivers with 14:19 left in the game. It was the first of four three-pointers by Rivers – she hit two on back-to-to-back possessions later in the half to move APSU with 12 points with 9:47 left. The Skyhawks would push the lead back to 18 points late in the half, and held that margin after Ashia Jones’ layup with 4:16 left. UT Martin would not score again in the contest, but Austin Peay found cutting into that lead difficult. The Lady Govs closed the game with an 8-0 run, a run that could have gone further except for a stretch of more than three minutes where the Skyhawks maintained continuous possession. Rivers led Austin Peay with 16 points off the bench, converting 4-of-7 from three-point range and adding a perfect 4-of-4 from the free throw line. Junior Tiasha Gray battled through another tough shooting night to finish with 14 points (5-of-15 shooting), six assists and six steals. Junior Jennifer Nwokocha added her season’s first double-double with 10 points and 10 rebounds. Austin Peay made just 29.4 percent (15-of-51) of its field-goal attempts, its worst shooting performance since the 2011-12 season. The Lady Govs compensated with season-highs in both free throws made and attempted, going 26-of-37 (70.3 percent) at the line. Jones led UT Martin with a game-best 34 points, scoring 21 points in the second half. The Skyhawks made 39.1 percent (27-of-69) of their shots, but just 54.5 percent (12-of-22) from the free throw line. 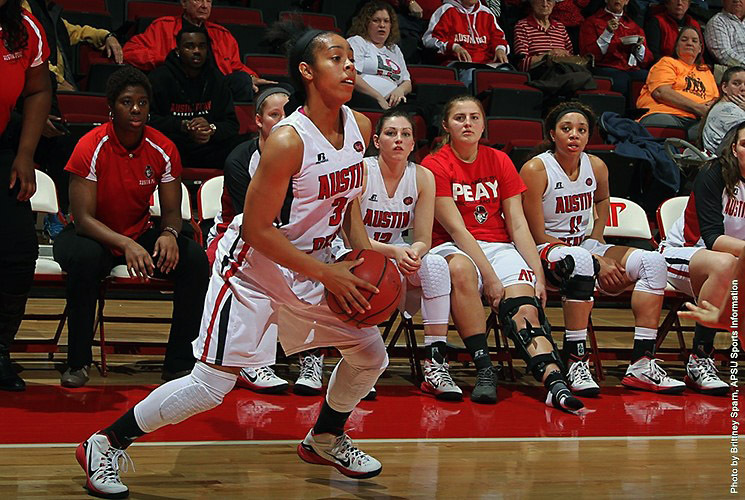 Austin Peay continues its four-game homestand when it hosts rival Murray State in a 4:30pm, Saturday contest.